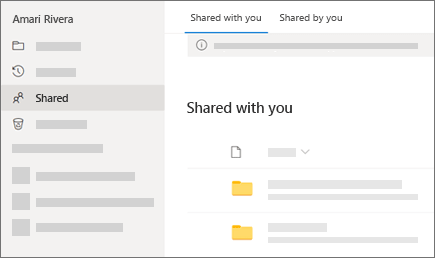 The Shared (OneDrive - Personal) or Shared with me (OneDrive - Business) view shows you files that others have shared with you. After someone shares a file with you, that file will automatically appear in the Shared or Shared with Me list. What you see differs depending whether you're signed in with a personal account or a work or school account. Select a tab below to learn more. Note: If you're an Office 365 subscriber, you can also see files others have shared with you from the latest version of Word, Excel, or PowerPoint. Sign in to OneDrive.com to see files and folders shared with you. Note: If you see different options, you're probably signed in with your work or school account. Click the OneDrive - Business tab above to see the experience for OneDrive for Business files. Click the file or folder to open it, just as you would any other item in OneDrive. 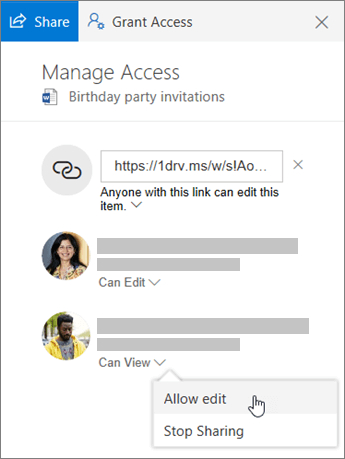 Note: When you open a shared OneDrive file while signed into your Microsoft account, people with permission to edit that file can see that you've opened it. People who can edit will also be able to see your name, email address, and profile picture. What do "Can view" and "Can edit" mean? People sharing items with you can give you permissions either to view the items or to edit them. Item marked Can view - You have view-only permissions, so you can only open and read the item. You can't move it or change it. Item marked Can edit- You can do more when you have edit permissions. 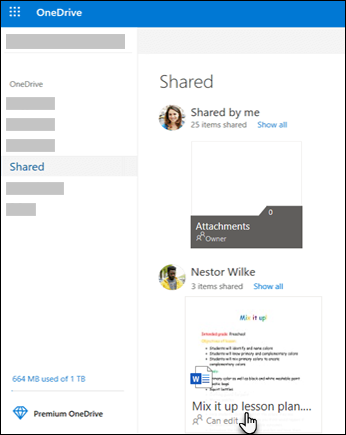 You can move and copy the item within the shared folder, or to your own OneDrive, and share the item with others. Tip: If you have edit permissions to a folder, adding the folder to your own OneDrive means you can keep the folder alongside your own folders and items in your Files list. It's also easier to move items between folders, and more easily work on items offline. Any updates you make sync with the shared folder, so everyone with access to the folder is up to date. For more information, see Add and sync shared folders to your OneDrive. If you no longer want or need access to a file or folder that's been shared with you, you can remove it. 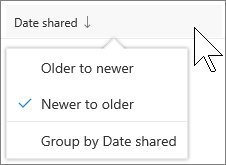 In the OneDrive website, from the left side navigation, select Shared. Select the file or files you want to remove from the Shared list, then select Remove from shared list. Tip: When you remove an item from your Shared list, you still have permissions to it. You can return an item to your Shared list if you use its link again. Ask the item owner for the link if you can't find it.. If you have edit permissions to a shared item, you can change other peoples' permissions to the item, or stop sharing it. In your Shared list, select the item that you want to change (hover over it and then select the circle). Select Information in the upper-right corner to open the Details pane. Select the X next to a link to disable it. Select Can Edit or Can View, and then select Stop Sharing. Select Can Edit or Can View and then select Change to…. If you don't see Manage access, you have view permissions to the item and you can't change others' permissions. In this case, only Remove from Shared list is available in the bar at the top of the page. If you select Stop sharing, the item no longer appears in that person's Shared list and they can no longer access it. When you remove an item from your Shared list, you still have permissions to it. You can return an item to your Shared list if you use its link again. Ask the item owner for the link if you can't find it. Permissions for individual files inside a shared folder can't be changed. For example, a file in a Can edit folder can't be changed to view-only. To change permissions for items in a folder, either remove them from the folder and reshare them with different permissions, or change the permissions for the entire folder. When someone shares a folder and gives you edit permissions to it, you can add the shared folder to your own OneDrive to make it easier to edit and work with the folder and its contents. If you sync the folder to your Windows or Mac computers running the OneDrive app, you can work with the folder offline. For more information, see Add and sync shared folders to OneDrive. Note: Shared folders added to your OneDrive do not use any of your OneDrive storage space. They only count against the folder owner's storage space. In the navigation pane, click Shared > Shared with me. To sort or group the items by column, click a column and select an option from the drop-down list. For example, click the Date shared column and then select Older to newer or Group by Date shared. To filter the items shown in the view, click the Filters icon above the list. Move the Modified anytime slider between Oldest and Today to select a date range when files were last modified. 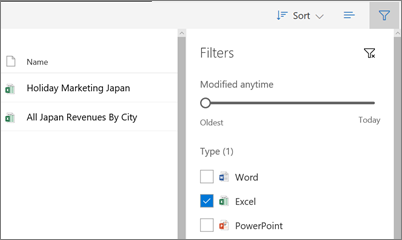 Select file types to filter on, such as Excel or Photos and videos. Under People, enter the name or email address of a person who has shared with you. Any items shared with you for which the permission was set to Anyone with the link can view and edit won't appear in your Shared with me view, even if the person entered your email address when they shared the item. Files that were shared with you before September 2017 will be missing information in the Date shared and Shared by columns. You can find files that are popular in your organization at the top of the Shared With Me view in the “Popular around me” section. "Popular around me" helps you easily access files that your colleagues are working on and keep up to date with the trending files in your organization. Note: You might not see the "Popular around me" section, depending on your organization. Only files that you already have access to appear under "Popular around me." A minimum of 3 items and a maximum of 8 items appear at a time and what appears will update periodically.